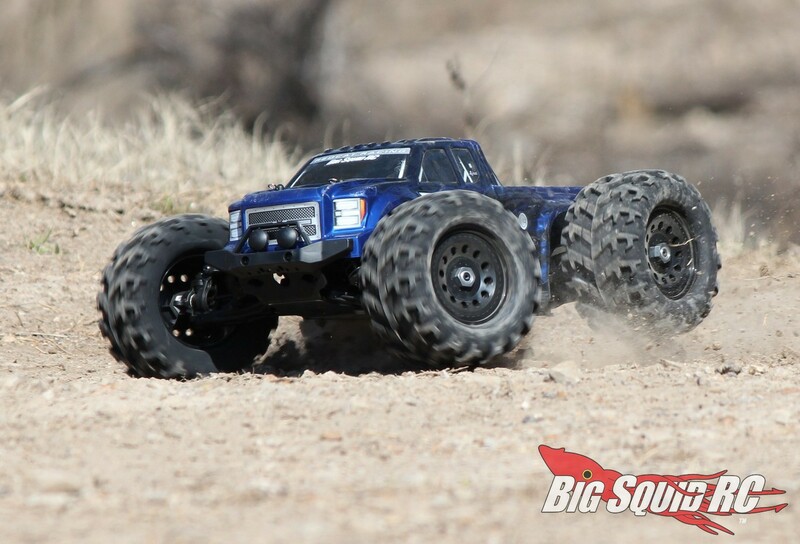 Redcat Racing Landslide XTE Monster Truck Review « Big Squid RC – RC Car and Truck News, Reviews, Videos, and More! 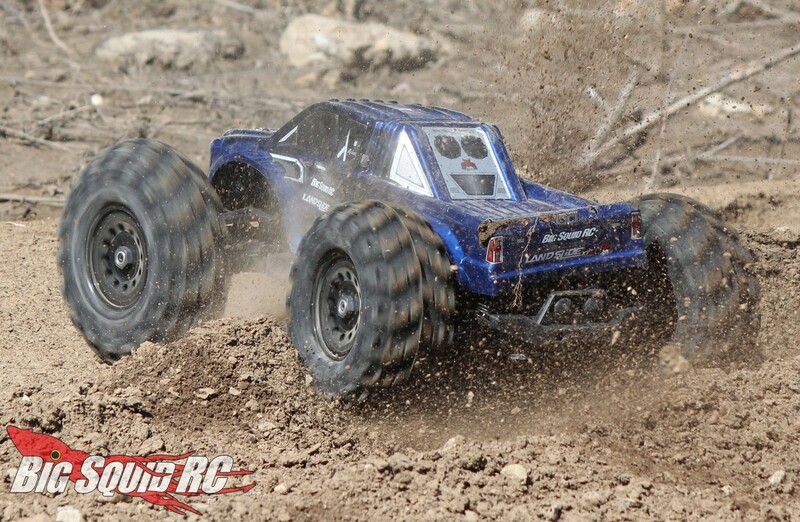 Primary Competition: The Redcat is labeled as an 8th scaler but really seems a bit smaller. 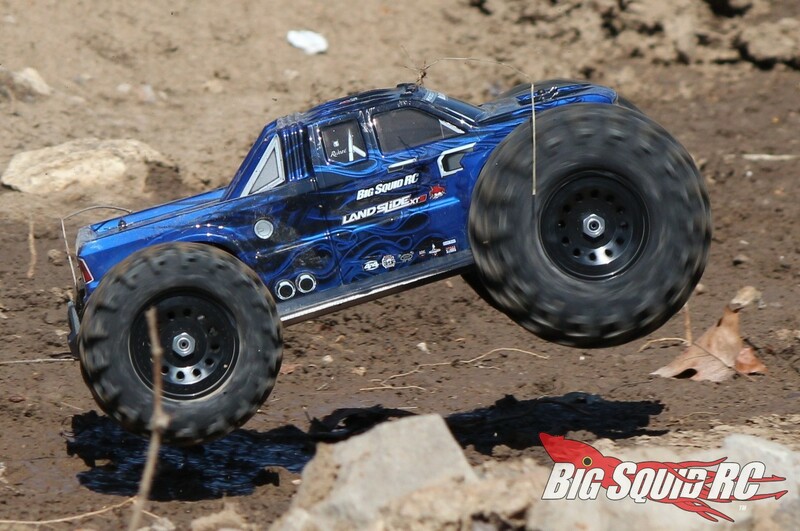 The Landslide XTE is bigger than 1/10th trucks like the Pro-Line PRO-MT 4×4, Traxxas Stampede 4×4, and ECX Ruckus 4×4. 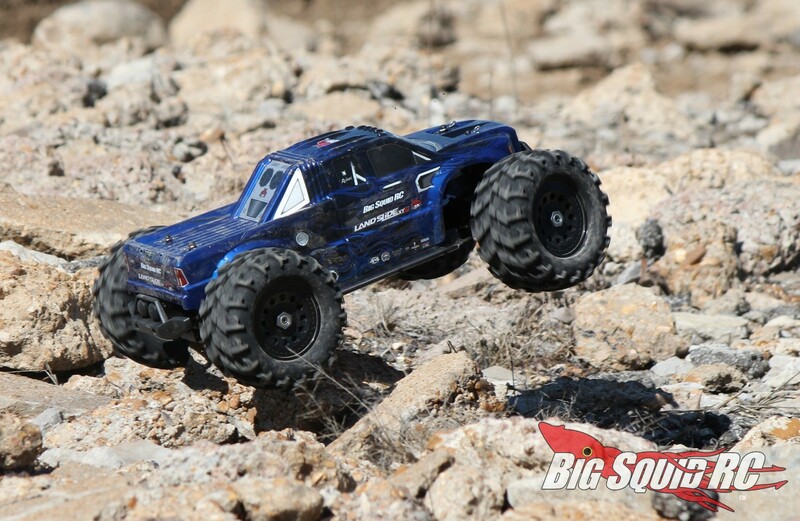 However, it is significantly smaller than what most people consider 1/8th scaled monster trucks like the Losi LST 3XLE, the Traxxas E-Revo 2, and ARRMA Kraton. What’s Needed To Complete: You will need four AA sized batteries for the transmitter and a pair of LiPo packs for the truck. Oh, and a battery charger. Build Quality: No, we couldn’t find any faults with the Landslide XTE. The gear mesh was good, the shocks felt good, the wheels were on tight, etc. Test Drivers: Iron Mikeee, Robbie G., Hawaiian Chris, Don The Legend, T-$$$, and yours truly. Test Venues: We used a pair of local parks for testing. Both had ample amounts of mud, sand, grass, hills, and pavement. Set-up Notes: We ran the truck as it came out of the box. For power, we ran four MaxAmps AA batteries in the transmitter, as well as a pair of MaxAmps 2S 5250 LiPo packs in the truck. We charged the batteries with a Hitec X1 Pro. Driving: Driving the Landslide XTE was a bit weird, but good. How was it weird? 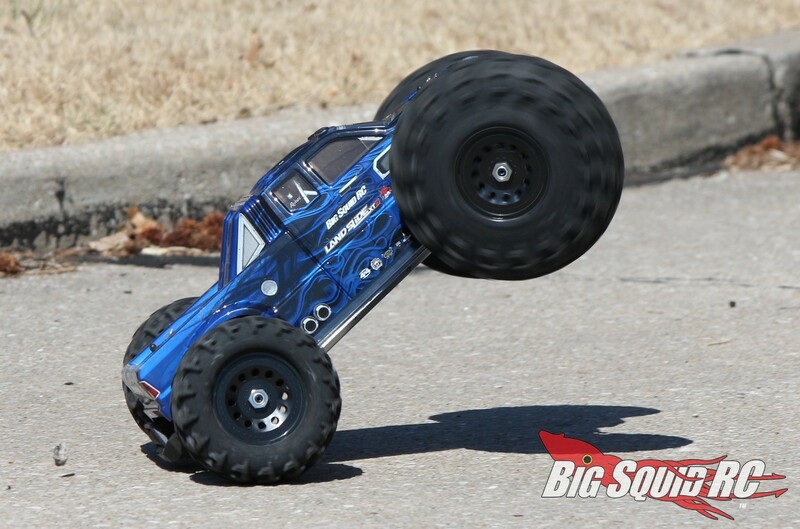 Well, it sports a more true scale form factor than most other monster trucks. 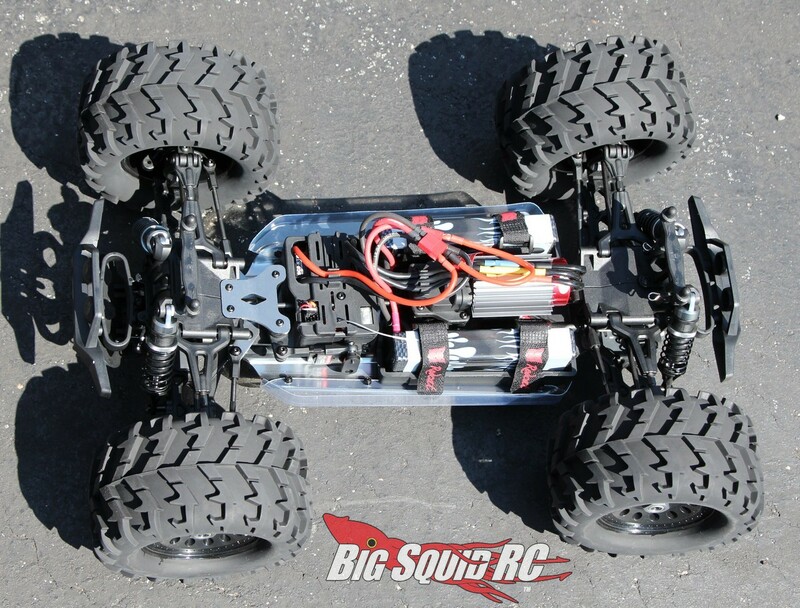 It is simply more narrow proportionately, then most rc monster trucks. Also, the Landslide XTE has a lot of bump steer. No, not in the front, but in the rear of the truck. Now, the bump steer on the rear of the Landslide XTE increases rear toe as the rear of the truck squats. This gives the truck a lot of forward bite, but makes the rear feel like it is wandering in some corners. 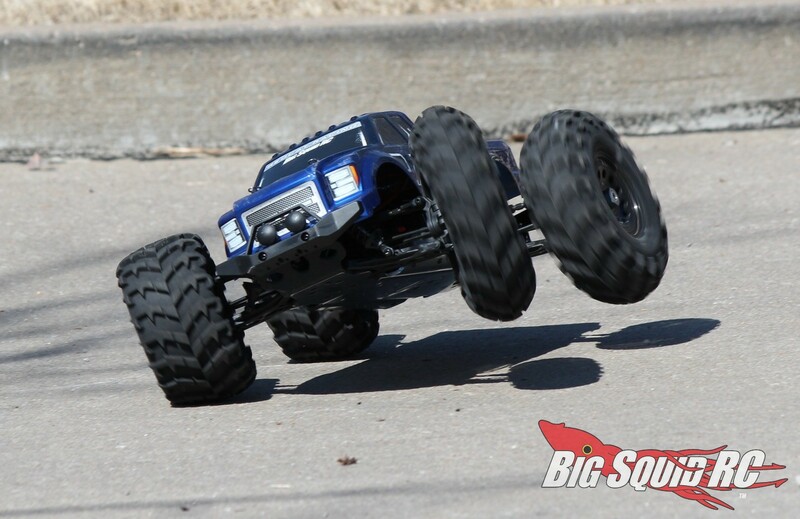 The narrow scale of the truck makes it drive more realistically than most monster trucks. The chevron style tires on the Redcat didn’t give the truck much sidebite. This kept the truck’s corner speeds lower, but also made it easy to drive. Overall, our test drivers had a blast driving the truck. It wasn’t planted all the time like a race oriented truck would be, it tended to bounce around more. Also, because of the low side grip of the tires, it didn’t traction roll as much as you would expect. Overall, we feel the choices made for tires and suspension make the truck fun to drive, and purposely that way. 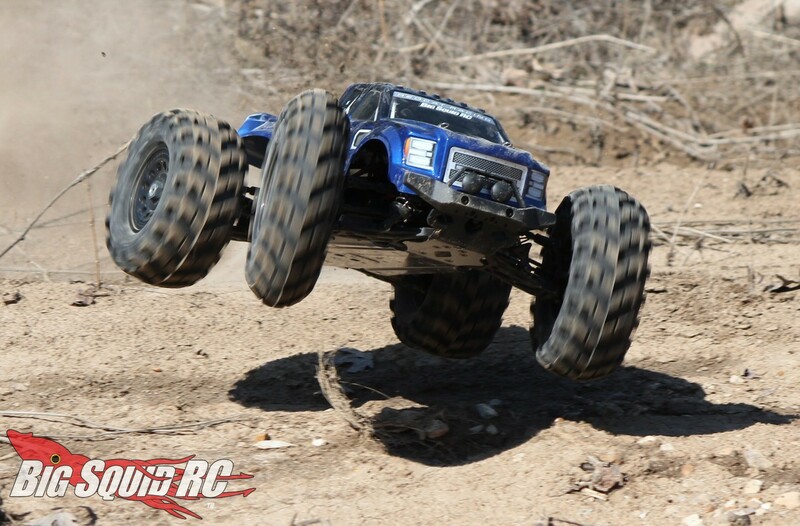 A couple of the guys on our test crew swear they like driving race style rigs better than “bashers”, yet their faces told another story when driving the Redcat. 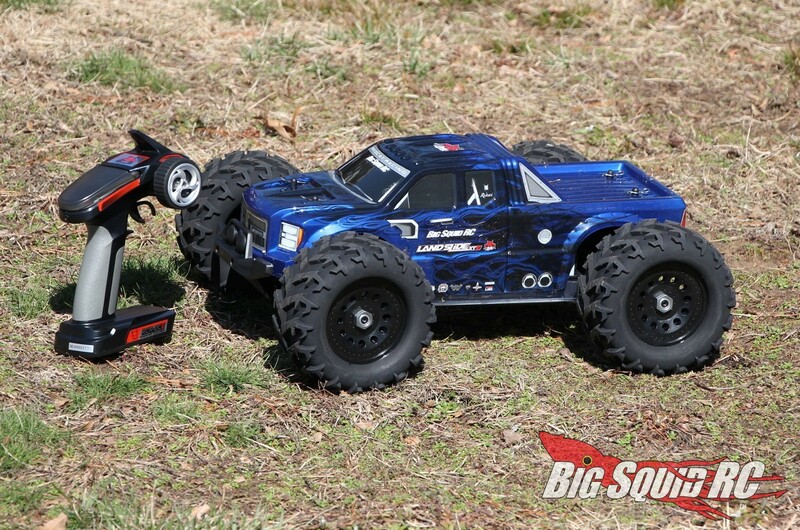 Lastly, the Redcat drove really well in grass and did OK for a monster truck on pavement. It has good power for making speed passes and such, plus it is beefy enough to tap the curbs a few times without breaking. 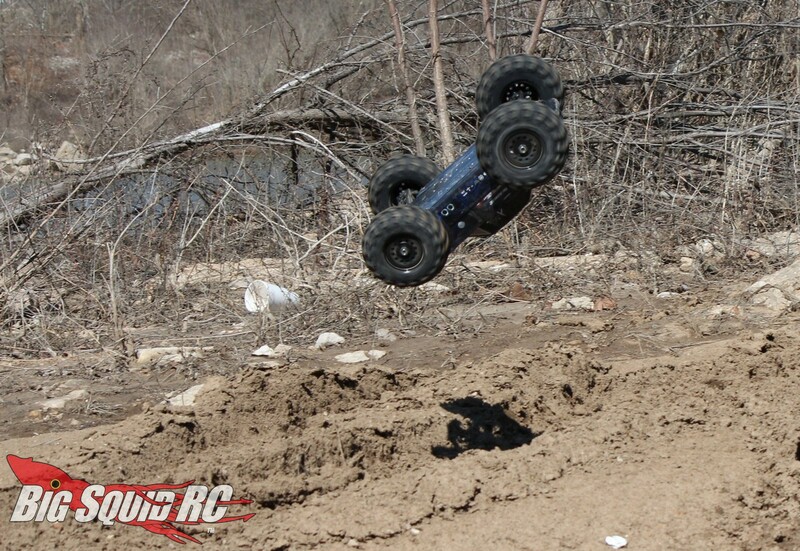 Power: The power system in the Redcat is more than capable of showing you serious brushless power. It has loads of torque off the bottom, a smooth mid-range, and good raw power up top. While not a silky smooth powerband, it has the kind we like to bash with- tons of torque with lots of top-end. If you are a first time driver it will be perhaps too fast, but if you are an experienced hobbyist, it has more than enough power for extreme bashing. Radio: The included unit is fairly plain but gets the job done. We like that it had a cover over the adjustments to keep them from being changed during transport, and we liked the rubber covering on the wheel. Also, it had plenty of range and never glitched. Broken Parts: So… back in the day this would have been the most important part of a Redcat review. Now days, it really is pretty normal. The last three Redcats we have tested have all been quite durable and we found the Landslide to be the same way. Our bash crew ran the truck like it was their own pack after pack, with no breakage. When we started getting more extreme, it took some pretty gnarly hits/landings, still without breaking. Robbie G. eventually tapped a curb at speed and stripped out the stock plastic servo arm, which isn’t a big deal and is cheap/easy to fix. Overall, we didn’t find durability to be an issue with the Landslide. 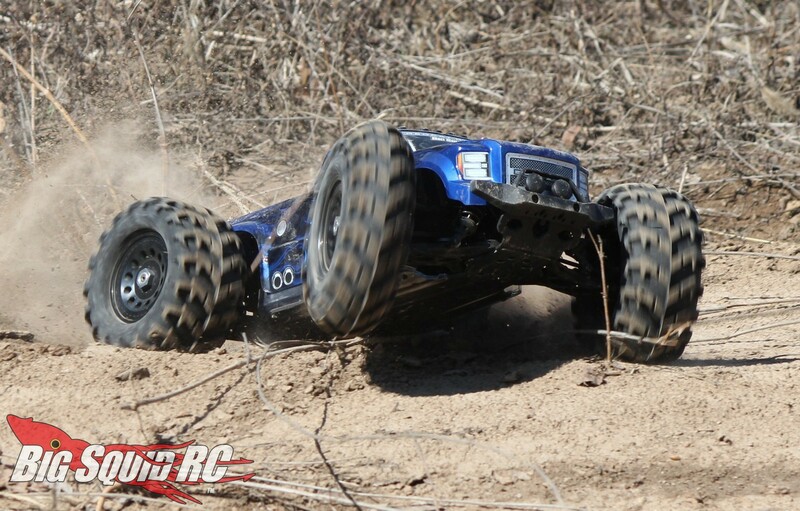 The Redcat comes stock with Deans connectors, heck ya! Most bashers have a pack laying around with a Deans plug attached, this makes it easier for experienced hobbyists to just throw a pack in. If you are new to the rc scene, you’ll need to buy packs with Deans connectors on them, or you’ll need to solder some Deans on. As mentioned earlier, the Landside has more of a scale layout than most rc monster trucks. Its more narrow overall width gives the truck more of a proper scale appearance, in addition to allowing it to drive in a more scale authentic fashion. Also, the rear hubs are just like the front, thus making it easier to add rear steering to the Landslide. The rear of the body wore quite quickly when bashing on pavement, but held up fine for the rest of our review. 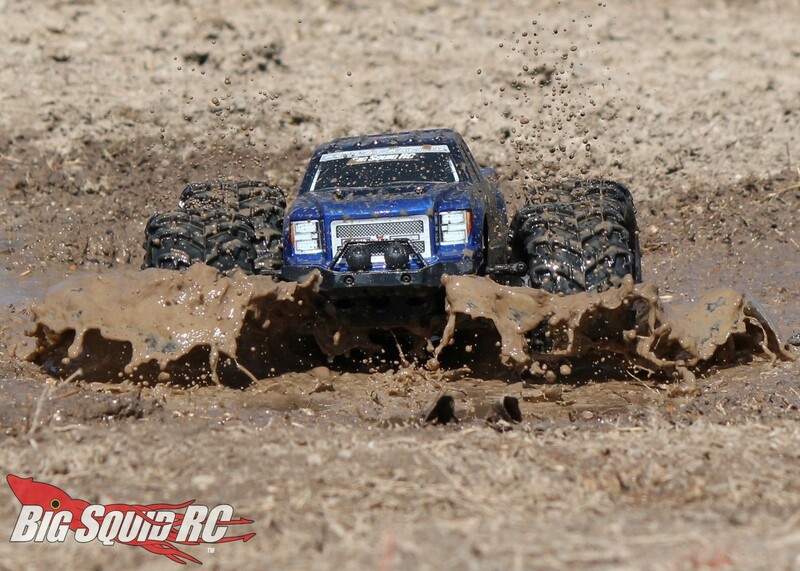 The Redcat was one of the only trucks we’ve ever reviewed that was hard to judge orientation at a distance. The body doesn’t have a lot of differences to be seen when it is just a speck on the horizon, and both bumpers are exactly the same. Is the Landslide XTE too fast for a first time buyer? We’ve seen people learn on faster trucks, but yes, we think it is on the fast side for a first timer. Yes, a first timer can learn with the truck, but all that power on tap will make it harder than it would have been with a slower brushed RTR. Speaking of the bumpers, the front unit looked decent and did a solid job of protecting the front of the truck. The rear bumper was exactly the same as the front. This looked a bit odd, a dedicated rear bumper would have been much preferred. Did the motor run hot? Ours did not. Our ambient temps were rather low, in the 40 and 50 range, and we never saw a motor temp above 150 degrees. Now, those of you in warmer climates will want to check temps on longer runs, but for the driving we did, ours was geared properly. Axle extenders are used to widen out the Redcat. These are not typically a good idea, but worked without issue on our test truck. 17mm wheel hexes? Heck ya, this makes it easy to find upgrade wheels and tires. Oh hey, the wheels nuts are serrated as well, nice attention to detail. Best Mod: Oh ya, that easily would be to get some thicker oil kicking in the center diff. This will help put more power to the rear tires, making it easier to pull wheelies and backflips. Oh ya, the truck would accelerate a lot harder too. Time To Bash: B Deans plugs come standard and we found the Landslide XTE to be easy to get up and running. Workability: B The included hex hardware is nice to work with, the truck’s open layout made it easy for us to wrench on. Car Show Rating: C The flame graphics on the body are very nice, the grill on the body is on-point, as are the wheels/tires. The biggest thing holding the Redcat back in this category is its rear bumper. Bash-A-Bility: B Yes, yes, and more yes, this Redcat can take a hit. 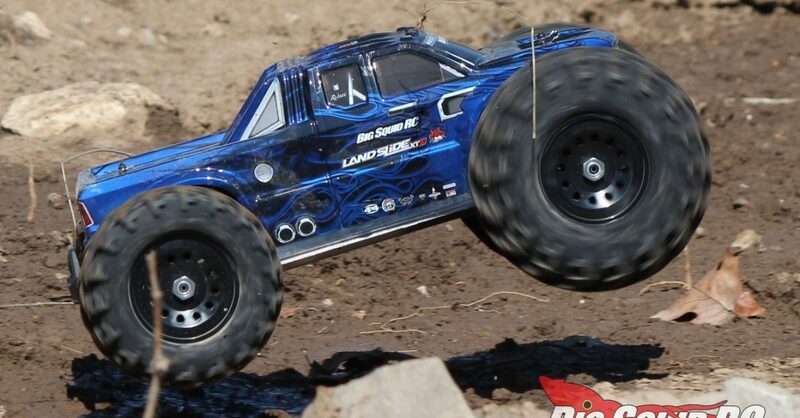 Our lunatic bash crew drove the Landslide XTE hard and broke very few parts. Fun Factor: B As related earlier, our test crew basically could not keep from smiling while driving the Redcat. Its combination of speed and toughness was also great for inspiring confidence from the driver. Handling: C While not the best handling truck in its class, our test drivers enjoyed driving a truck that had some monster truck bounce to it. Value: B Street priced at $299, we feel like the Landslide XTE gives you a whole lot of good times for the cash. Parts Availability: C No, we were not able to find any parts locally, but were easily able to find them on-line. 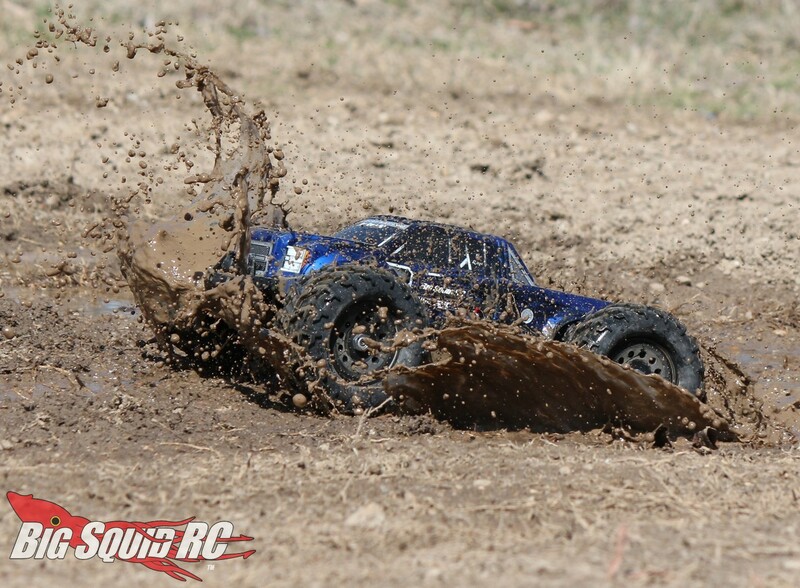 BigSquid Rating: B- We found the Redcat Landslide XTE to be a solid bash truck. The Landslide XTE never failed to put a smile on our faces and held up quite well. Yes, we can recommend the Landslide XTE to anyone looking to go big with their bashing this spring.